In a report written for the University of British Columbia Prof. Michael Byers, who is a UBC international law professor and Canada Research Chair in Global Politics and International Law, recommends that the government end its current ship building process and relaunch an expedited procurement that would save money by using only fixed-price competitions and off-the-shelf ship designs. Prof. Byers, whose common sense and expertise tend to alienate observers at all ends of the political spectrum, has made some startling recommendations in his report entitled “Onto the Rocks: With disaster looming, National Shipbuilding Strategy needs urgent change of course”. In the report he argues that The National Shipbuilding Procurement Strategy, now apparently known as the National Shipbuilding Strategy, should be restructured. As it stands the goal of the National Shipbuilding Strategy is to create a long-term project which will renew Canada's federal fleet of combat and non-combat vessels. Partnerships have been formed with two Canadian shipyards to deliver vessels to the Royal Canadian Navy and the Canadian Coast Guard. It is fondly believed that this strategy will provide economic benefits to Canadians and rebuild the country’s shipbuilding industry. Open-up the non-contractually-binding umbrella agreements with Irving and Seaspan. Cancel the Canadian Surface Combatant design competition and re-launch the entire procurement as an expedited fixed-price competition involving completely off-the shelf designs. Cancel the Joint Support Ship design contract and re-launch an expedited fixed-price competition for the immediate conversion of a second container ship into a supply ship. Shelve the plan to build a heavy polar icebreaker in Vancouver and launch an expedited fixed-price competition for the conversion or construction of 4-5 medium icebreakers. Needless to say, this is not a restructuring; this is essentially throwing out the entire plan as it now stands. Byers sites mounting costs, brought about by a lack of competition and rising inflation, along with lengthening delays (for example the Joint Support Ship procurement began in 2006 but is still in the pre-construction phase, with Seaspan being awarded a contract in February 2017 to “help develop and finalize the design.”) as some of the reasons he advocates this radical shakeup. Perhaps the most telling example of the failure of the NSS as it currently exists is the proposal by Fincantieri of Italy and Naval Group of France that, under their direction, Canada’s chosen contractor, Halifax-based Irving Shipbuilding, build 15 ships based on the consortium’s FREMM frigate design, which is proven and is in operation with the French and Italian navies. They are offering to guarantee the cost of the ships at a fixed $30 billion. Essentially these companies don’t believe the current $62-billion Canadian Surface Combatant program, with all its problems, will be successful. It was their belief that the potential of $32 billion in savings for Canadian taxpayers would put pressure on the Liberal government to seriously consider the offer. In a statement dated December 5, 2017 the government through Public Services and Procurement Canada made it clear that they would not even consider “any proposals submitted outside of the established competitive process”. In other words, they are not willing to evaluate the proposal by the Naval-Fincantieri group because they do not really know how much it would cost and they do not know how much it would cost because they will not evaluate it. A compelling example of circular thinking that cannot be argued with. Those in charge of procuring warships have made it patently obvious they believe that the process is more important than the outcome. Prof. Byers perceptive report has missed an important point. 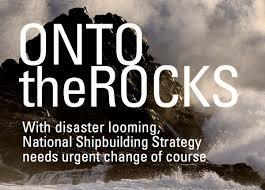 The National Shipbuilding Strategy is indeed headed for the rocks, but those in charge don’t really care. It doesn’t matter to them if this ‘ship’ ever arrives at its destination as long as those on the bridge never have to change the routine they have established. It is clear that the current program for renewing Canada’s navy is doomed to failure. What is not clear is what the consequences will be for the nation’s security.